Problem: won't build lighting. the option to Build Lighting Only is greyed -out. "Build" only appears to build Navigation stuff. I have a Light Importance Volume enclosing my entire map, a Directional light and Atmospheric Fog. The Docs are no help. I looked this up on Google and somebody reported their "UnrealLightmass.exe" was missing *(non-SquadSDK user)*. they replaced it and all was well - they could Build lighting again. I tried this adding it to the SquadSDK version (copied-pasted into its folder structure) but it did nothing. @DanielNL : apparently it has to do some shader'ing things first-run. what i'd like to know is why it "hangs" at 71%, every time i run it? and, does anybody else get the editor hanging on "Undo" commands? mine does most "sessions" and can stall for up to 10 seconds or so - each Undo command. Igno, you're awesome, mate! i had no idea i will make those adjustments (kinda glad we don't have to calc the lighting, actually ). Heheh! . . . Oopsy! Hello all! I am trying to tear apart the current inventory system and replace it with one made by me. I assume that currently the inventory system is not using blueprints, and mine would be. Anyone have any suggestions on where to start... or where to even find the current inventory system? Yes.Get on Discord where there`s a miriad of other modders helping each other. LADDERS: dimensional constraints and/or collision requirements. Could one of the Devs post the relevant dimensional constraints for creating a "ladder" that will work with the game and character animations, please? Or, are we able to modify (re-model/adjust) the current Ladder asset and have it still work correctly? ps: please do not direct me to Discord, thanks. The Unreal Editor 4.11.2 - Squad stops initializing at 71%, and it seems to freeze there, I'm using the unreal engine squad development kit. every start it will hang at 71% for 1 minute before continuing. its fine, its just thinking. although you have prolly already worked this out by just being patient, i hope. Right, thanks, I'll give this a go whenever I can. How can I edit the textures of models and make my own factions? having an issue with leaking light through polygons, from the main (movable) light source. the rafters and framework are receiving light when they should not. i have gone through many posts and docs about leaking light, and i have tried everything to do with the "shadows" stuff. i have also narrowed it down to the Directional Light as the problem (settings at right). i have basically copied the settings from Jensen's Range for the directional light, sky sphere and sky light. i have another building (timber) that has the same problem - same roof type. my other (concrete) buildings are not having the same problem - although they did/do whilst the directional light was at full power. so how do you stop light being cast through polygons that are supposed to be solid? while I have no idea about the second problem, have you looked into the material being used for the roof? i so haven't had time to get back to this lately, which sux! but, as for the Material, it is one of the standard Squad Materials and is 'double-sided' (or whatever it's called). it appears to be an issue with the way UE4 currently works - the whole light bleeding through polygons thing (aka. light shining through terrain) - a known bug. the only option i have left to try, at some point i can find the time, to get around the problem is by making a second Roof Skin and scaling and placing it inside the original to make a Double-Skinned roof - hoping that this will fix it, otherwise myself, and others, will have to wait until Epic fix it. Hello i'm quite new to this game and I like it. 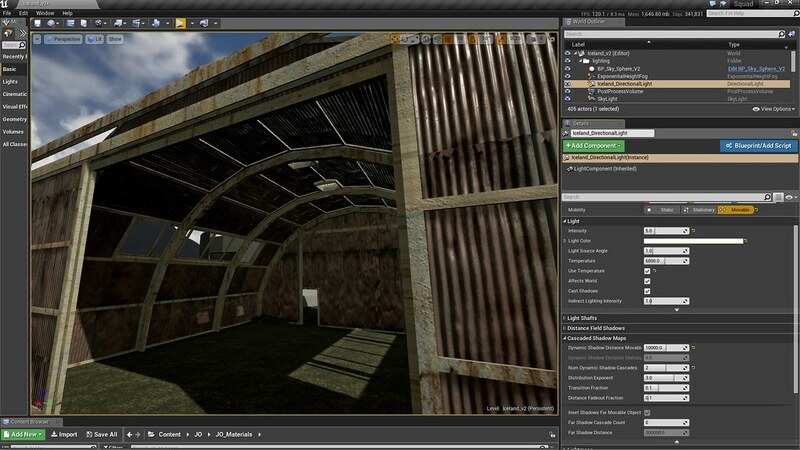 I have worked with previous Unreal tools and made maps for various games and now got interested in the tools for Squad. I have some questions about the folders and path where I save my project. As for now it seems to save it in the games maps folder. I dont think this is correct. I could not find any topic on this. Is there a user content folder ? Can someone shines a light on that ? in the editor - saving each map and all it's bits'n'pieces in a <your map name> folder, inside the "Maps" folder within the Contents structure, is the norm. @IrOnTaXi can confirm this i'm sure. Thanks, thats what I dod. The video tutorial series posted yesterday cleared that one out. Thanks again. @Jack-Jack: some errors like that have come up since the first iteration of the SDK - each update to it has had changes to these errors. The errors are only for missing assets that the Dev(s) have not fully included for some reason, hence missing only parts of some assets. These look to be the work of @oxygencube (his name in the error string), who is the lighting guy, amongst other things i imagine. Give him a ping if things still worry you. edit: the navmesh works in jensens training camp so that will do for my purposes. My vehicles drives on top of the water instead of in the water. I use the waterplany muddy mediam speed. The spline in the Gorodok rivers uses a collsion profile name with multiple values for collision for the river and in the editor in that map the vehicles there drives in the water. In my map the collsion profile name is none. Anyone knows where to set the collision value for my splines ? When I try the SM_env_river used in Gorodok it ends up only visible under the terrain.